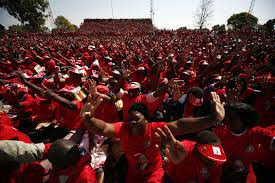 The Nelson Chamisa-led MDC has mobilised its supporters to take to the streets on Thursday to demonstrate against the worsening economic situation, which has seen prices of all goods and services skyrocket as the surrogate currency – bond note – continues to depreciate in value. Party spokesperson Jacob Mafume confirmed the protests date and said they had since notified the police. “Indeed, our demonstration is coming this Thursday. The national council endorsed it, but the idea came from the people during our consultations from across the country,” Mafume said. He said the idea of taking to the streets came from the people, who are not happy with the deteriorating socio-economic situation in the country. The economy has been on a downward spiral since the July 30 polls, controversially won by President Emmerson Mnangagwa and rejected by Chamisa as a “farce”. “Zimbabweans are so over-taxed. We are having this burden of additional 2% taxation; medicines are now being charged using US$. Duty of some items, including motor vehicles, are paid in US$ yet the bulk of the people get their earnings in RTGS,” Mafume said. In October, Finance minister Mthuli Ncube introduced a 2% transactional tax on electronic money transfers, and the separation of RTGS accounts from nostro foreign currency accounts, measures which have been blamed for triggering economic chaos in the country. Mafume said it was illogical to peg traffic offenses at $700, an amount far above the general earnings of the majority. He also said they will be pressing on the need for political reforms during the Thursday demonstrations. The demonstrations would start in Harare, but would be rolled across the country.